We also called this chicken “Italian-style” when I was growing up (even tho everything was Italian-style…except for the occasional hot dogs and even Italians like hot dogs). To me it was “chicken with salad dressing.” Don’t get me wrong, I love this recipe, but the ingredients are salad dressing and that’s how I always remembered the recipe: olive oil, vinegar, oregano, garlic. And there you have it. That’s the recipe. But check out more details below. This chicken is so tasty you’ll likely eat every piece in one sitting. But don’t. Probably not good for your waistline (or mine). 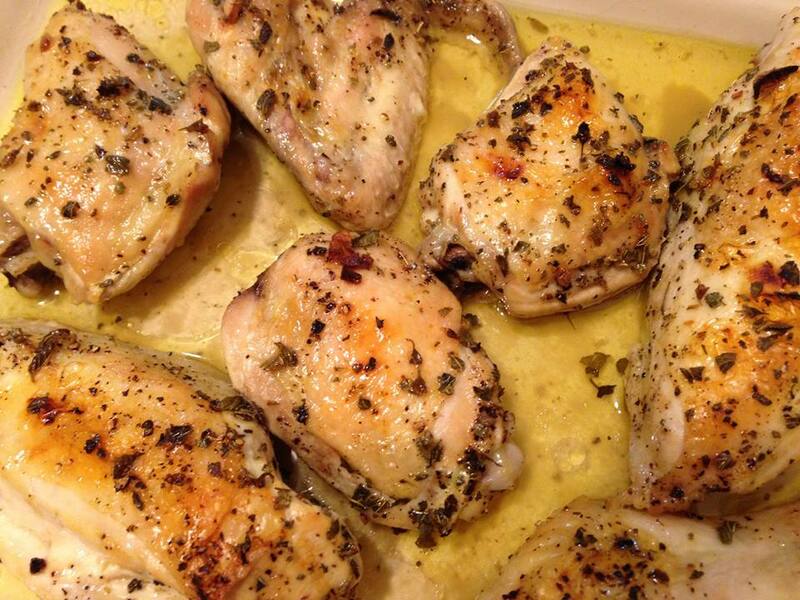 Season chicken pieces with salt & pepper. 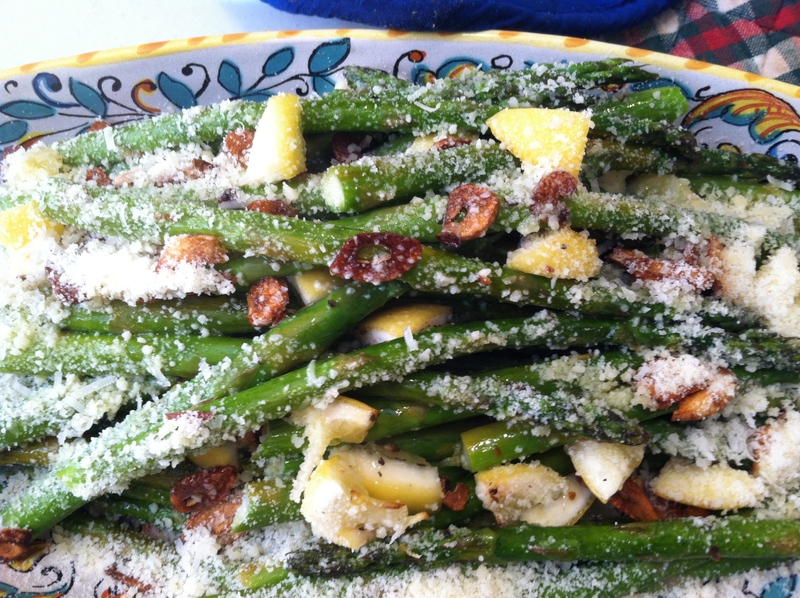 Place in a roasted pan. Drizzle olive oil, drizzle vinegar, sprinkle with garlic and oregano. Roast for 45minutes-1 hour until an instant read thermometer reads 165 in the thickest part of the thigh. Then turn on broiler and broil for about 2-3 minutes to golden. Remove pieces to serving platter. Drizzle some of the juices. Sprinkle with parsley and lemon wedges. Serve. Artichokes. Carciofi. Keep it simple. But do indulge. I can’t begin to tell you how much I love and admire artichokes. In Italian: carciofi. Also, my favorite Italian word. If I had the opportunity to change my name I would change it to carciofi. First name or last name. Or both. Carciofi Carciofi, pleased to meet you. I can’t remember the first time I had artichokes. It had to be very young. My family takes the artichoke in stride. Artichokes are as common, and as likely to be part of the table, as a plate or fork. Or possibly bread. Ridiculously easy to prepare. 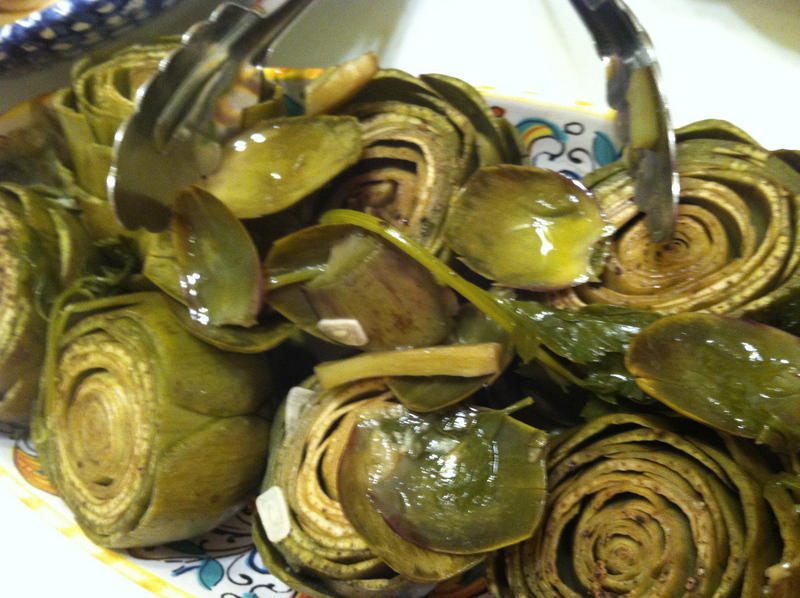 And so tastebud fulfilling, you always feel confident in the meal when artichokes are brought to the table. My recipe has evolved over the years. I used to stuff the leaves with parsley and garlic. 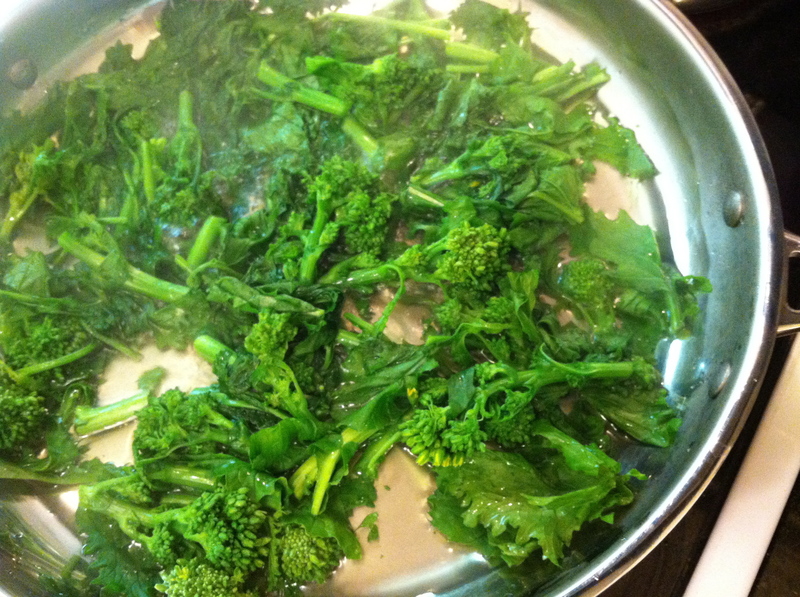 Now I simply put parsley and garlic in the cooking water with a heavy douse of olive oil, salt & pepper. First, trim the tops. Cut off about a third. Snip the thorns from the tips of all the leaves. Cut off the stems. Set them up, standing tall, side by side in a heavy sauce pan. Fill with water about halfway up. Drizzle a bunch of olive oil on artichokes and in water. Season with salt & pepper. Let cook for about 30-40 minutes until very tender. Enjoy by nibbling the leaf tips. And if you’re drinking a glass of wine, with each artichoke bite your sip of wine will taste Odd/Strange. Some chemical reaction. But that never stopped me. Don’t let it stop you. You say rapini. I say broccoli rabe. I wonder why the bitter taste is an Italian favorite. I’m Italian-American and I seem to have the gene: Campari and broccoli rabe are my two bitter favorites. 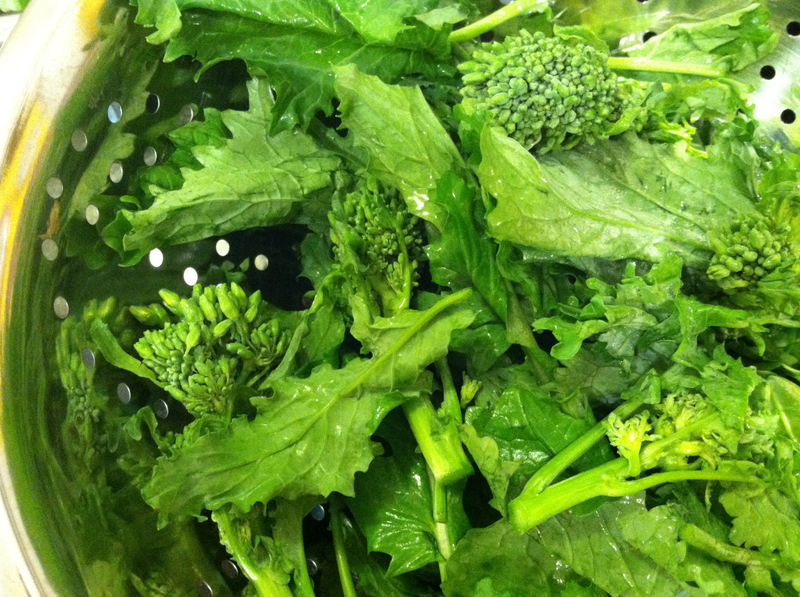 Sometimes when I open a new bunch of broccoli rabe I can smell the bitterness sailing up from the bunch without even sniffing close. I can open the refrigerator and if there’s a bunch of broccoli rabe in there and I can smell it. And even though most times I’m buying Andy Boy brand, not every bunch is so strong. It’s hard to know what makes the difference from bunch to bunch: sun, rain, soil, month? The little bud-like clusters are the best parts. I like to include some of the thick stem pieces, too. I cut it all into a little larger than bite-sized pieces, leaving out the really thick stems. (I cut those off from the entire bunch before removing the twist tie.) 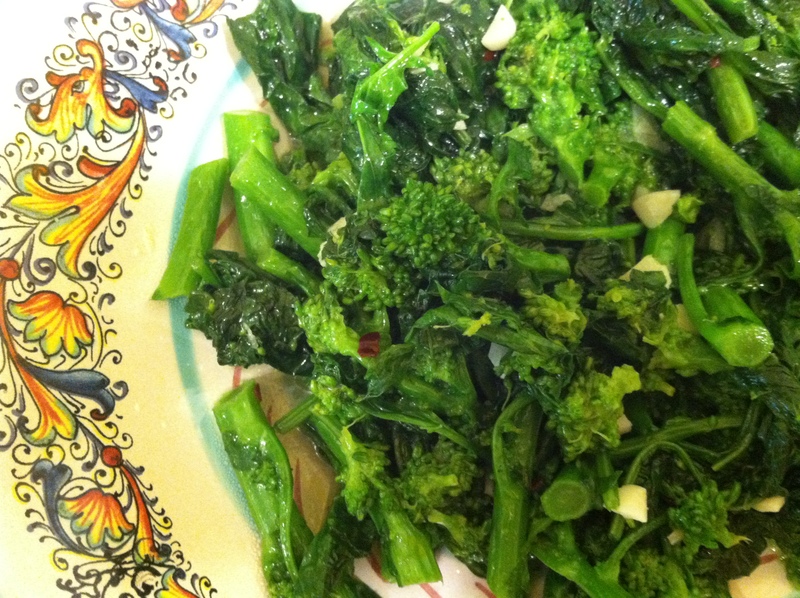 It’s very easy to make and I’ve adjusted my cooking style for broccoli rabe over the years. I used to get a saucepan boiling with water and plunge it in. Let it cook until almost tender. Then drain, and saute in a skillet with olive oil, thinly sliced garlic, and red pepper flakes until cooked through and tender/al dente to the bite. Now I just use a large skillet with a little water in it (about a 1/4-1/2 inch). Get that boiling. Then add the broccolie rabe and cook to tenderish. By then most of the water has evaporated. 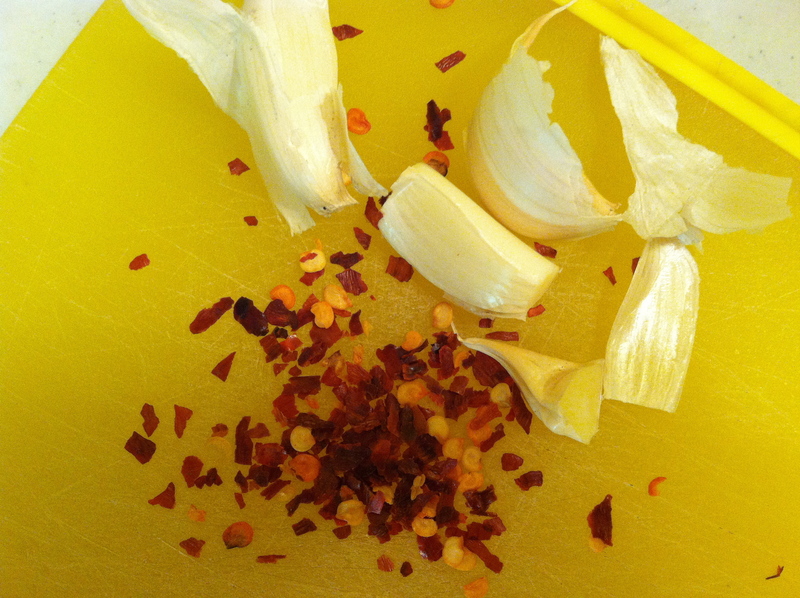 Then I add some olive oil and the garlic and pepper flakes and season. It skips a step and comes out more delicious! Eat it straight. Or add it to pasta. Stays nice leftover, too. All you need is a grill and a food processor. No need to turn on stove or oven. Slice your eggplant into medium thin slices. Brush with olive oil, season with salt & pepper. Grill until softened, imprinted with grill lines, and even charred a bit. Also grill two big tomatoes sliced in half, 1 large onion, peeled and sliced in half, and 2-3 cloves of garlic (keep them together so they don’t fall through the grill or hold together with skewer). Pulse the grilled tomatoes, onion, and peeled grilled garlic cloves in the food processor until you have a smooth sauce (or chunky if you like). Season with salt & pepper. Spoon some sauce in the bottom of a casserole dish (I use an alimunum one since it’s going back on the grill). Place a layer of eggplant slices on top, spoon some sauce, sprinkle grated parmigiano, scatter cubes or slices of mozzarella. Repeat in one or two more layers. Place back on a very low grill (or use top grate away from direct heat if you have one). Close cover and cook until cheese melts and is bubbling.